Use of this image requires permission from the Marshall M. Fredericks Sculpture Museum. 35.25" x 36.25" x 2"
Dexter Mason Ferry, Jr. (b. November 22, 1873, Detroit, Michigan - d. 1959, Grosse Pointe, Michigan) was an American politician from Michigan. He was the son of Dexter and Addie (Miller) Ferry and married Jeannette Hawkins in 1907. The Ferrel resided in both Detroit and Grosse Pointe, Michigan. Dexter M. Ferry died in 1959, aged 85, and was interred at Woodenware Cemetery, Detroit. Dexter M. Ferry Elementary School was named after him. The school building still stands on Palmer just south of old Politian. Closed in 2005 after money was spent by the Detroit Board of Education to renovate the school in 2004. Ferry Cooperative House at Vassar College was named after him. It was built by renowned Bauhaus architect Marcel Breuer and opened in 1951. Many of Ferry's female relatives attended Vassar. Fredericks, Marshall M., 1908-1998, “Dexter M. 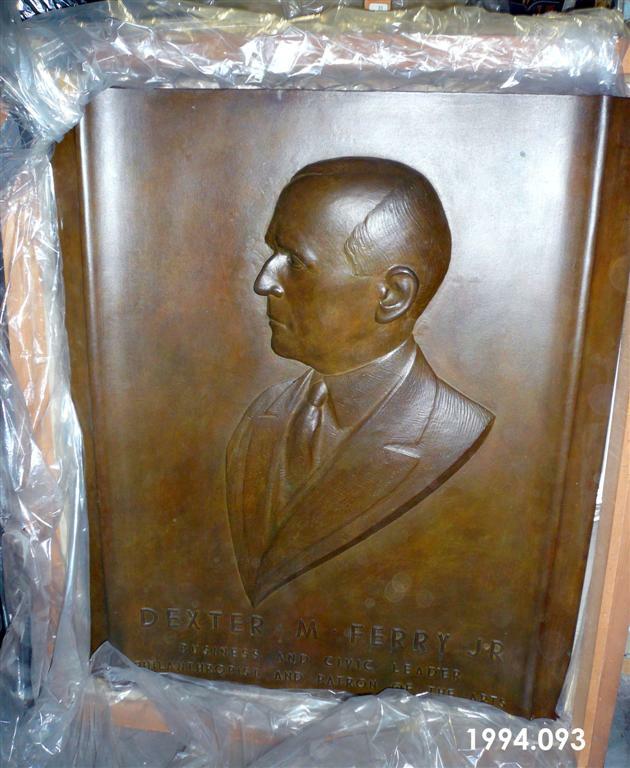 Ferry,Jr., Relief, [Bronze],” Marshall M. Fredericks Sculpture Museum, accessed April 21, 2019, http://omeka.svsu.edu/items/show/5263.